Your presentation will make an impact. Your documents will be professional. Your analysis will be insightful. And Office 2008 will be there. The latest version of the industry standard for productivity software on the Macintosh platform. 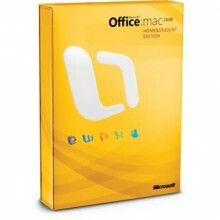 Microsoft® Office 2008 for Mac is more powerful and easier to use. Office 2008 combines Microsoft Word for Mac, Microsoft Power-Point® for Mac, Microsoft Excel® for Mac, Microsoft Entourage® for Mac, and Microsoft Messenger for Mac and lets you easily create high-impact documents and seamlessly share your ideas with others, whether they are on the Mac or Windows® platform. Powerful new tools, more than 100 designer templates, rich themes, and an intuitive user interface will help you make your ideas look as good as they are. It's a numbers game. With Excel 2008, analyze, share, and manage your data, and easily create persuasive charts and thought-provoking graphs for powerful results. Your presentation is a story that PowerPoint will illustrate exquisitely. Its compelling visuals and engaging layouts will inspire your audience's imagination. Your emails will spark ideas, you'll schedule meetings where creativity abounds. Entourage 2008, the hub of Office 2008, helps it to happen, one task at a time.